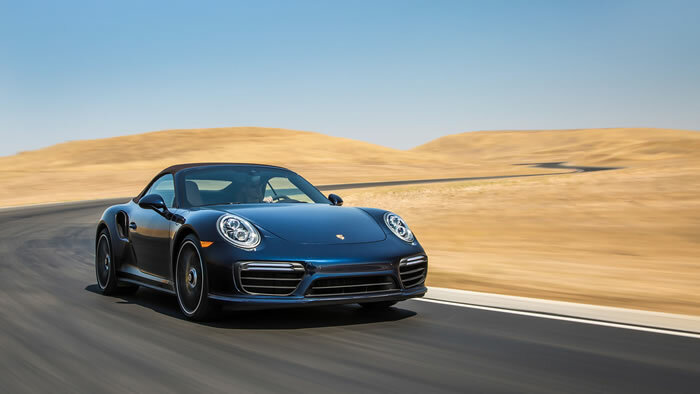 The top-of-the-range models within the 911 lineup – the 911 Turbo and 911 Turbo S – now offer a sharper design, further enhanced features and 20 hp more than the previous models. Performance and handling profit from innovative solutions such as the new Dynamic Boost function and the Sport Chrono Package which are now standard on all 911 Turbo variants, significantly improving responsiveness. 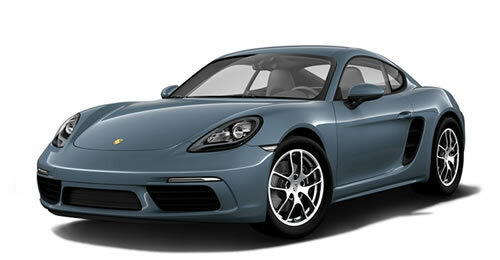 The models are on sale now and are available as Coupe and Cabriolet versions. 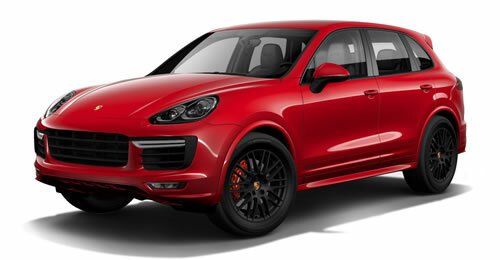 3.8-liter flat six-cylinder engine with twin-turbo chargers and variable turbine geometry. 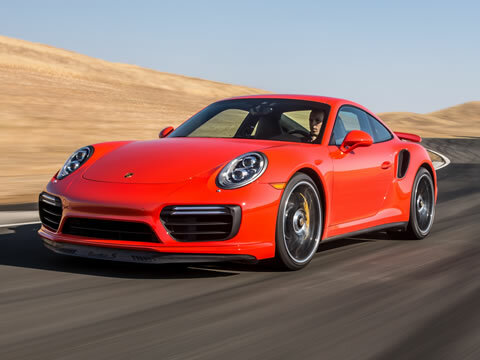 Each model has 20 hp more: the new 911 Turbo now makes 540 hp while the output of the 911 Turbo S has increased to 580 hp as a result of new turbochargers with a larger impellers.The new Dynamic Boost function maintains boost pressure during load changes, which improves throttle response. For the best possible intermediate acceleration, the Sport Chrono Package comes with four programs and the Sport Response button as a standard option. 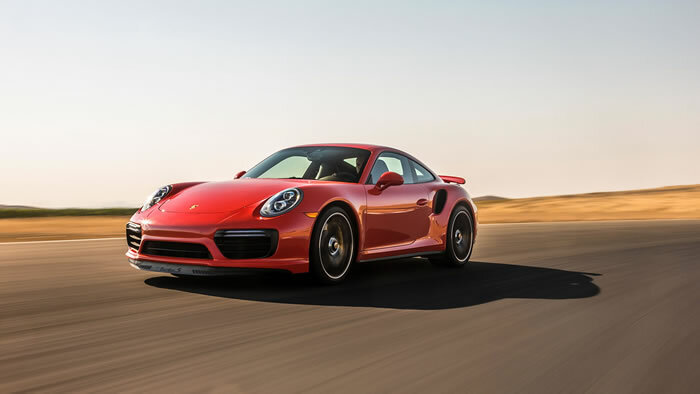 Acceleration is stronger than ever before: the 911 Turbo Coupe sprints from zero to 60 miles per hour in 2.9 seconds, and the 911 Turbo S in 2.8 seconds — each is 0.1 seconds faster than the previous model. 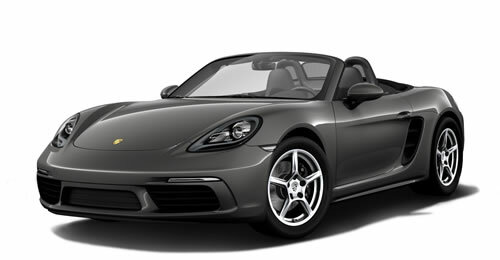 The Cabriolet variants need just 0.1 second more than the coupes to reach 60 mph. 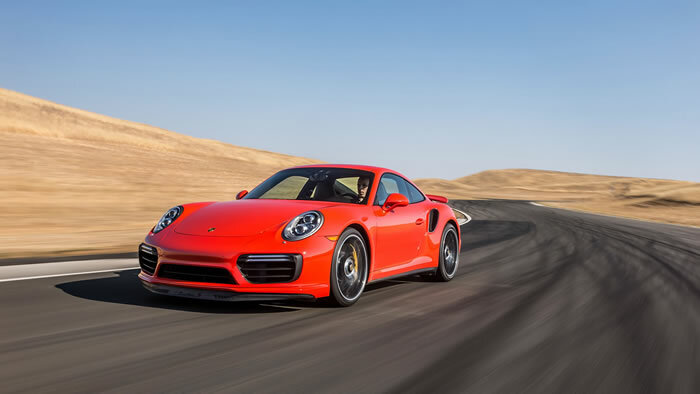 Top track speeds are higher as well reaching speeds of 205 miles per hour for the 911 Turbo S (7 mph faster than before) and 198 miles per hour for the 911 Turbo (3 mph faster). The 2017 Porsche 911 Turbo models are rated at 19 mpg city/24 mpg highway/ 21 mpg combined according to the EPA. This represents a 2 mpg improvement in the city and combined cycle compared to the previous version. The operation and programming of the Porsche Doppelkupplung transmission (PDK) in the new generation of 911 Turbo shows even closer ties to motorsport. When the gear selector is in manual mode, the shifting direction to select a higher or lower gear has been reversed compared to the previous model. 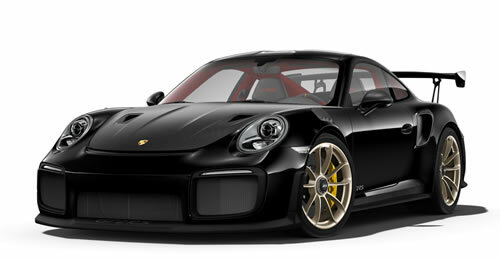 It is now essentially identical to that used in the 911 GT3, the 911 GT3 RS and in race cars. Pushing the gear selector forward initiates a downshift, and pulling the lever back an upshift. The system also prevents automatic upshifting in manual mode, giving the driver full control over the shifting process. The engine now bounces off the rev limiter, clearly audibly indicating the necessity to upshift. 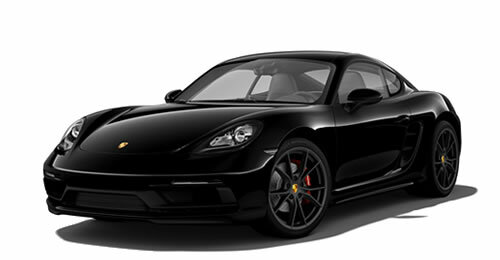 As in the 2017 911 Carrera models, the dual-mass flywheel of the PDK transmission now features an integrated centrifugal pendulum. It improves engine smoothness at very low rpm ranges by compensating for engine vibrations. 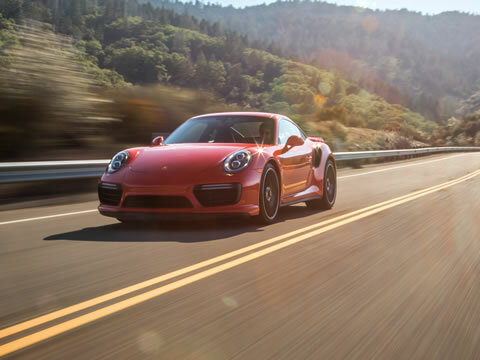 In the new 2017 911 Turbo, Porsche is driving sports car technology to the next level. 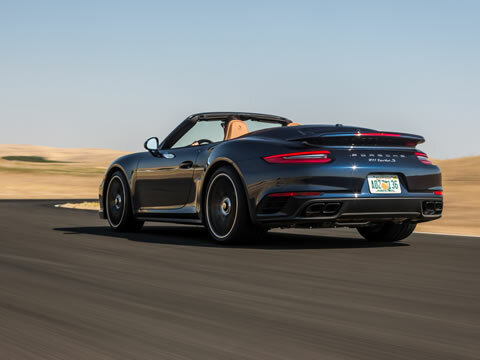 The new top-of-the-range 911 models develop 20 hp more than before thanks to enhanced powertrains that offer exceptional throttle response and performance figures as well as improved efficiency. 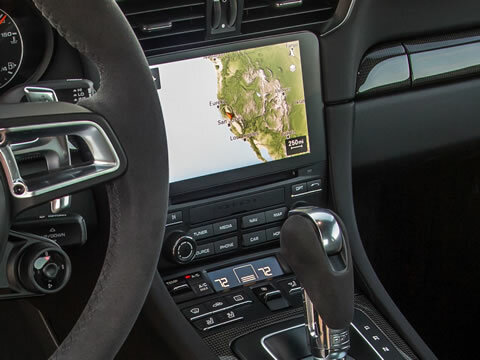 Like all other 2017 911 models, the 911 Turbo comes standard with the new Porsche Communication Management with online navigation, Connect Plus and traffic information in real time as well as an automatic post-collision braking system. Lane Change Assist is optionally available. 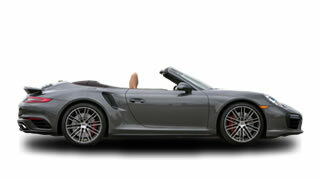 The new 911 Turbo and 911 Turbo S are available in both Coupe and Cabriolet body styles. 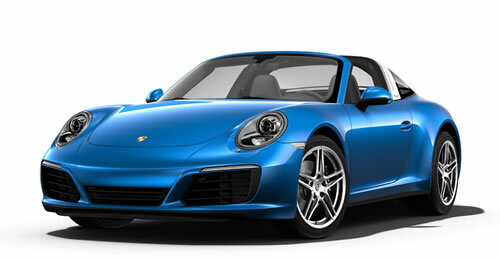 Higher boost pressure increases the output of the twin-turbo six-cylinder engine in the 911 Turbo to 540 hp. 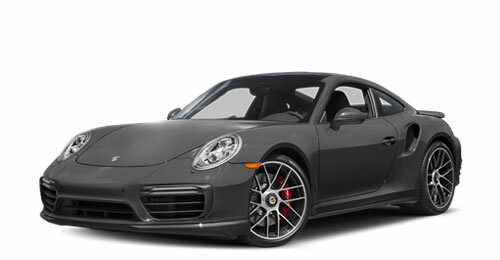 Thanks to its turbochargers with larger impellers and other enhancements, the 911 Turbo S now develops 580 hp. In addition to a higher maximum torque (553 lb.-ft. in overboost compared to 523 lb.-ft. on the Turbo), the Turbo S also has a higher redline with 7200 rpm instead of 7000. 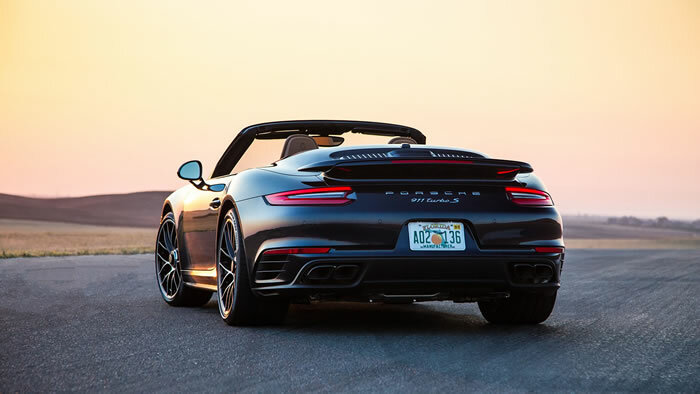 Porsche is still the only manufacturer to use two turbochargers with variable turbine geometry in a gasoline engine.This enables breathtaking acceleration figures for the new high-performance sports cars. 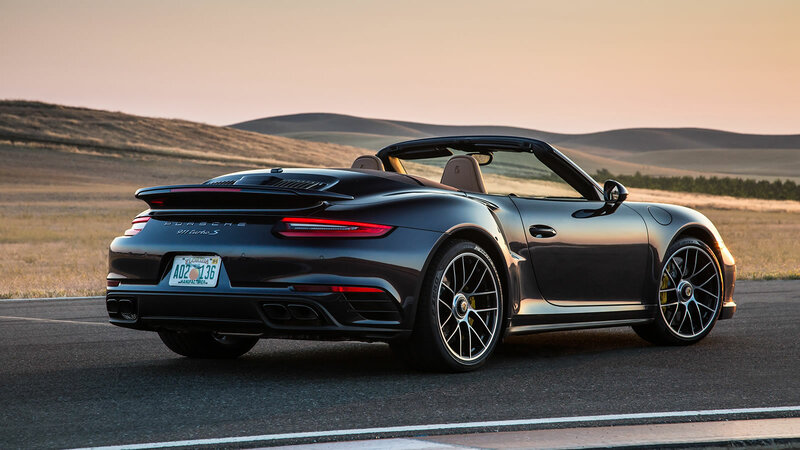 The 911 Turbo S Coupe sprints from zero to 60 miles per hour in 2.8 seconds (0.1 seconds faster than the 560 hp predecessor). 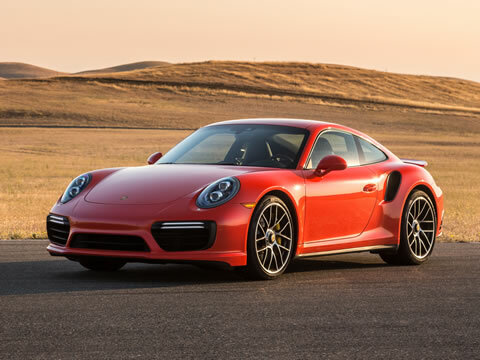 Its top track speed of 205 miles per hour is 7 miles per hour faster than the previous 911 Turbo S model. 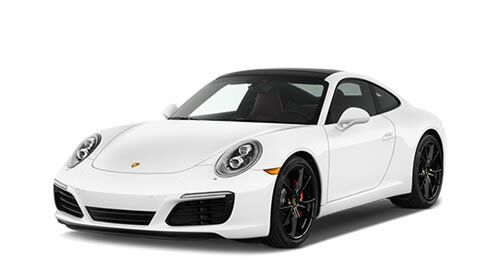 The 911 Turbo Coupe reaches 60 miles per hour in 2.9 seconds. Its top speed is 198 miles per hour – 3 miles per hour faster than before. 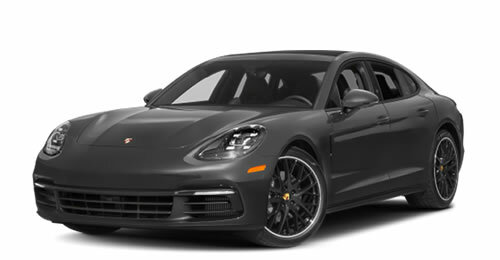 Fuel economy is rated by the EPA at 19 mpg city/24 mpg highway/21 mpg combined for all 2017 911 Turbo models, representing a 2 mpg improvement in the city and combined cycle. New features such as Dynamic Boost and the extended Sport Chrono Package with a mode switch and Sport Response button on the steering wheel further enhance the driving experience. 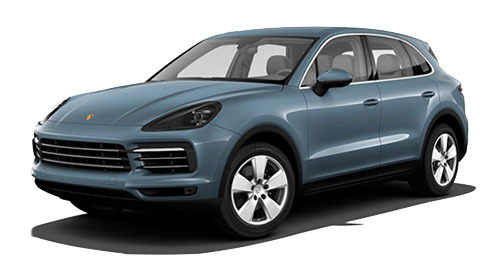 Dynamic Boost reduces the response time of turbocharged engines to load changes to a barely perceptible minimum. This is particularly noticeable when reapplying the throttle after braking for a turn. When the accelerator pedal is pressed, the engine responds with practically no delay. To do this, Dynamic Boost maintains boost pressure. 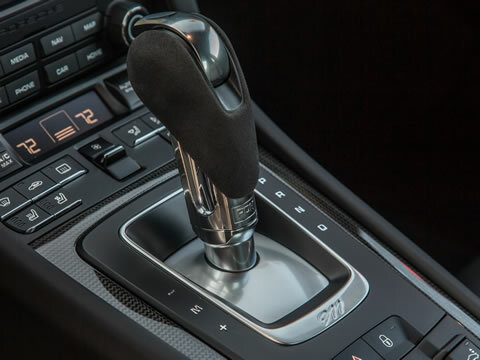 Normally, the engine control unit closes the throttle valve when the driver releases the accelerator pedal, which results in a drop in boost pressure. 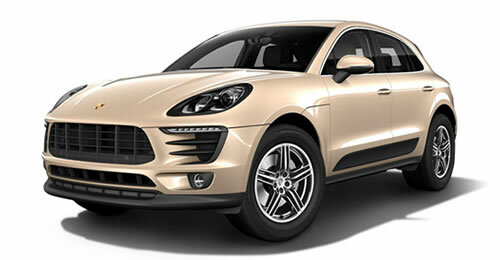 Dynamic Boost keeps the throttle valve open, and it only interrupts the fuel supply. 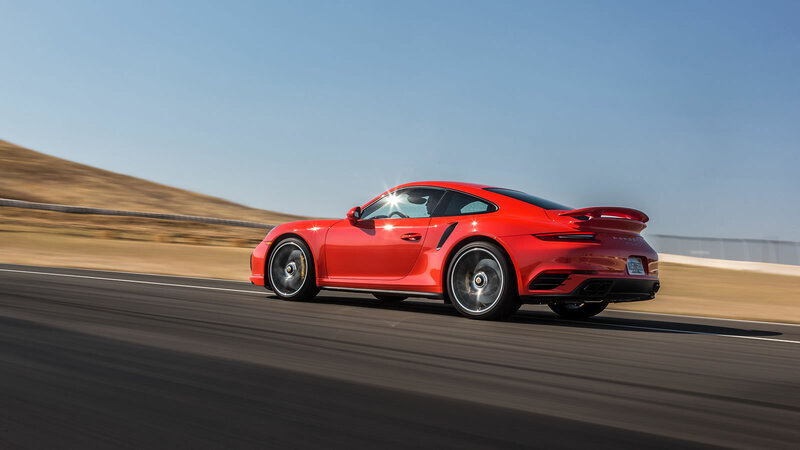 As a result, the turbocharger continues to generate boost pressure, which improves throttle response and acceleration when the accelerator pedal is pressed again. 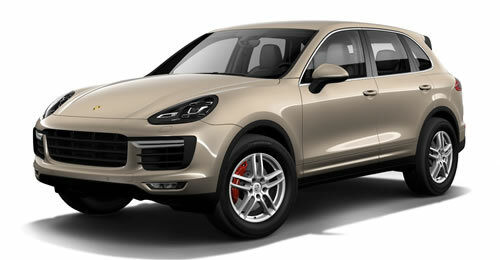 Dynamic Boost is always active, but it has more pronounced effects in the Sport modes. The boost pressure gauge on the instrument cluster informs the driver of how the system is being used. 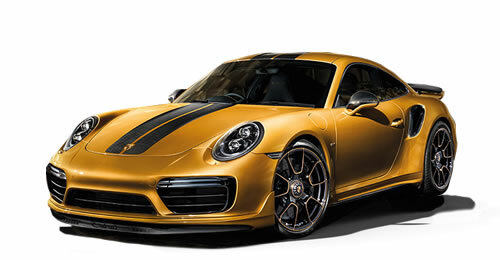 Porsche has re-bundled the Sport Chrono Package for the 911 Turbo. Instead of buttons on the center console, the driver can now select between the different driving modes using the mode switch with four positions, which is included on the new GT sport steering wheel. The new steering wheel measures 14.1 inches (360 millimeters) in diameter. In addition to the three familiar settings Normal, Sport and Sport Plus, this switch also offers the Individual mode. 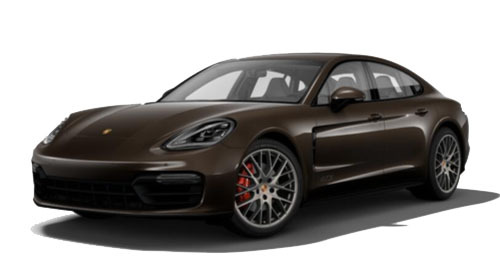 In a menu in the instrument cluster, this mode lets the driver combine individual settings for PASM, auto stop-start function, front spoiler and rear wing as well as PDCC, if included, and lets the driver store these combinations as his favorite driving mode. If Sport or Sport Plus is selected as the preferred engine mode, the overboost function is also active in Individual mode. 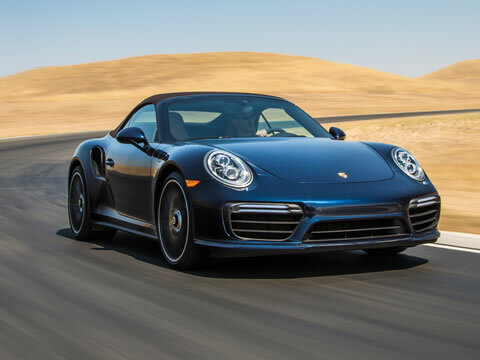 In the Sport modes, it increases boost pressure in the mid-rpm range by around 2 psi, which boosts maximum torque – in the 911 Turbo it is boosted from 487 to 523 lb.-ft., and in the 911 Turbo S from 516 to 553 lb.-ft. Moreover, the proven Launch Control feature generating the best possible acceleration is also standard. A new feature is the Sport Response Button located at the center of the mode switch. 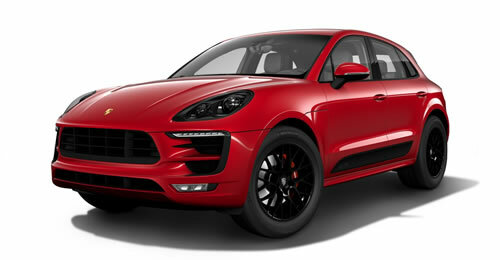 Inspired by racing, it sharpens the vehicle’s responsiveness at the push of a button. 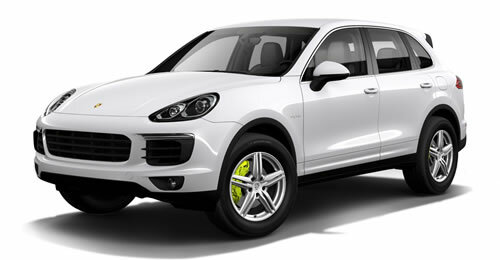 When the Sport Response Button is pressed, the engine and transmission are calibrated for maximum responsiveness. In the part-load range, Porsche Dopplekuplung (PDK) immediately downshifts one gear so that engine speed is in an optimal range: between 3,000 rpm and 6,000 rpm. 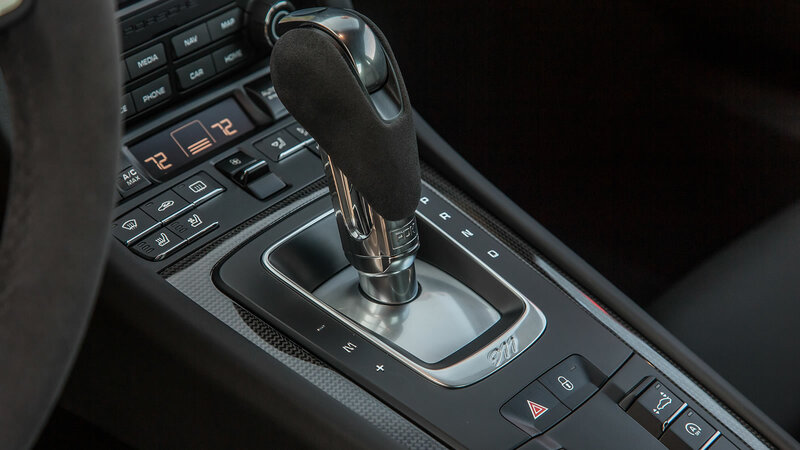 At the same time, PDK uses a special gear shift mapping compared to the Sport Plus mode, delaying upshifts to a higher gear. In addition, the ignition timing is retarded, and the turbocharger blades close using variable turbine geometry. At the same time, the throttle valve is slightly opened, which increases mass flow, and the speed of the turbocharger’s turbine wheel rises. The next time the accelerator pedal is pressed, the engine reacts much more directly and develops its maximum power faster. The Dynamic Boost function also switches to Performance mode. After 20 seconds, the vehicle automatically returns to the previously selected mode. A timer that counts down in the instrument cluster informs the driver how much longer the Sport Response function will still be active. The function can be deactivated by pressing the Sport Response button again and can be used as often as desired. 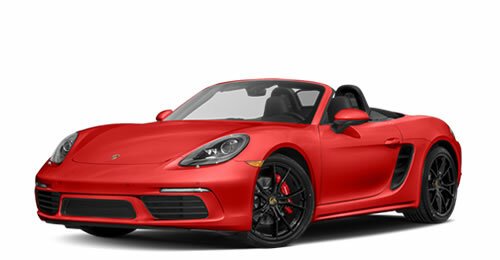 To improve performance and handling, the new 2017 911 Turbo models feature dynamic engine mounts with increased bearing spring rates. Dynamic engine mounts use existing sensors to detect aggressive driving and respond by stiffening the liquid-filled engine mounts; magnetic particles suspended in the liquid increase its viscosity when exposed to an electric current. 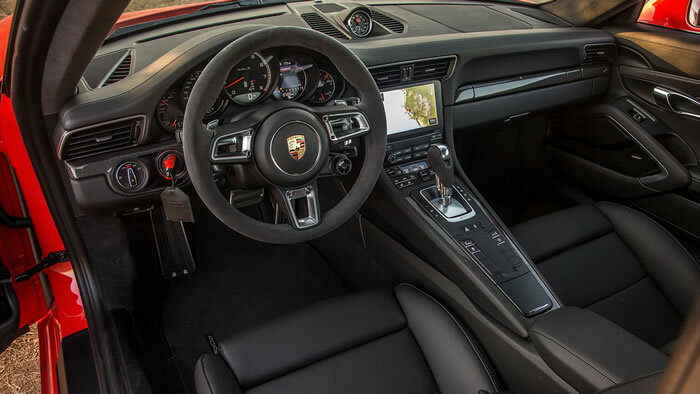 The latest generation of the 911 Turbo offers more comfort in Normal mode thanks to a modified PASM system. In Sport or Sport Plus, the damping of the bearing increases progressively to a level of stiffness suitable for race tracks. 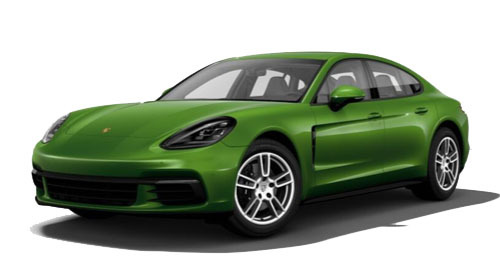 This firms up the connection between the engine and the chassis, and the engine does not transmit any disruptive mass forces in high-speed cornering. Another advantage is improved traction when accelerating from a standstill. 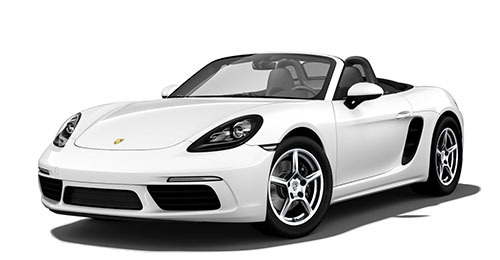 For its top-of-the-line sports cars, Porsche continues to use flat six-cylinder engines with twin-turbo charging and 3.8 liter displacement. Both versions have a turbocharger with variable turbine geometry, direct fuel injection, an expansion intake system, integrated dry sump lubrication and an electronic demand-based oil pump. 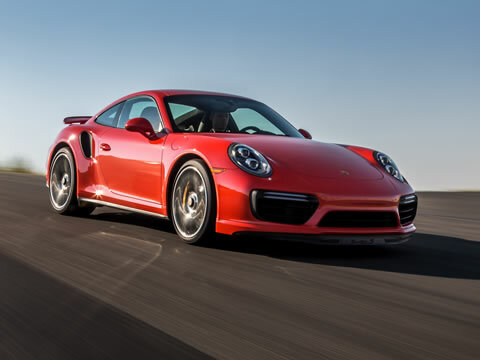 For the first time, there is a mechanical difference between the engines of the 911 Turbo and 911 Turbo S: to increase the power of the new 911 Turbo S, turbochargers with larger impeller wheels and a modified housing supply process air to the high-performance engine. At the same time, the maximum injection pressure of the direct fuel injection system was increased from 2,030 psi to 2,900 psi for both variants.This reduces exhaust emissions and improves better efficiency. To do this, engineers redesigned the entire fuel injection system, including the injectors. The increased pressure atomizes the injected fuel more, enabling the fuel to mix better with the combustion air. This effect is reinforced by a homogeneous fuel-air mixture that is achieved by a modified air induction system and modified intake channels in the cylinder head, which tumble the air even more intensively. 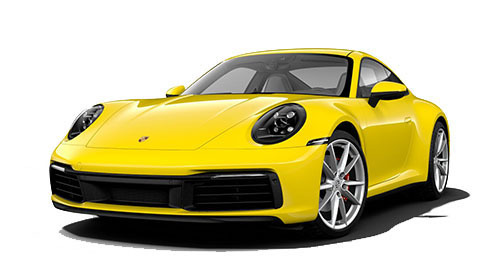 In addition, the higher injection pressure can cover fuel needs better given the higher maximum engine power of the 911 Turbo S.
For the first time, a lift system for the front axle is available for the 911 Turbo models. The electrohydraulic system lifts the front end of the car by around 1.5 inches measured at the front spoiler at low vehicle speeds. By increasing the approach angle and ground clearance at the front axle, the lift system increases the everyday usability of the car when entering or exiting driveways or parking structures or clearing speed bumps. The system is operated by a button on the center console and can only be used while the engine is running. Lifting or lowering the front end takes around five seconds, and the system’s current state of activation is shown in the instrument cluster. 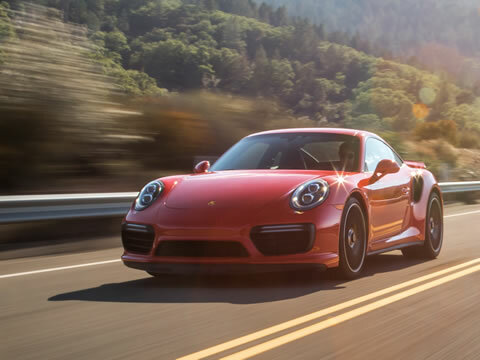 The Porsche 911 Turbo combines efficient high performance and full-fledged everyday usability unlike any other sports car. 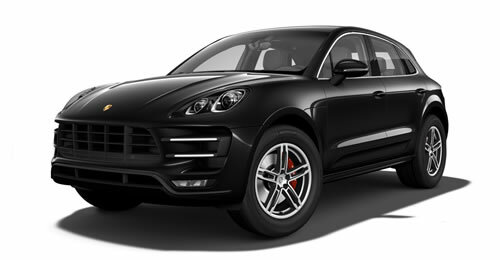 Active systems like the intelligent Porsche Traction Managment (PTM) all-wheel drive, rear axle steering, adaptive aerodynamics and Porsche Torque Vectoring (PTV) Plus, promote performance and stability alike. 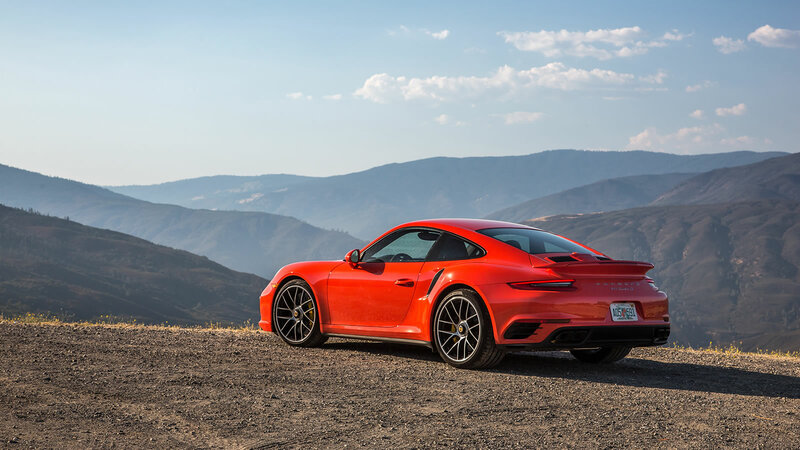 The 911 Turbo S, with its full complement of standard features, also has the PDCC roll stabilization system and the PCCB ceramic braking system as standard. 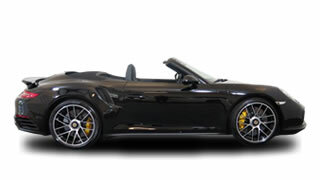 These systems are optionally available on the 911 Turbo. A new generation of tires offer lower rolling resistance and increased grip. Many improvements and innovative functions enhance the performance of the new 911 Turbo models. 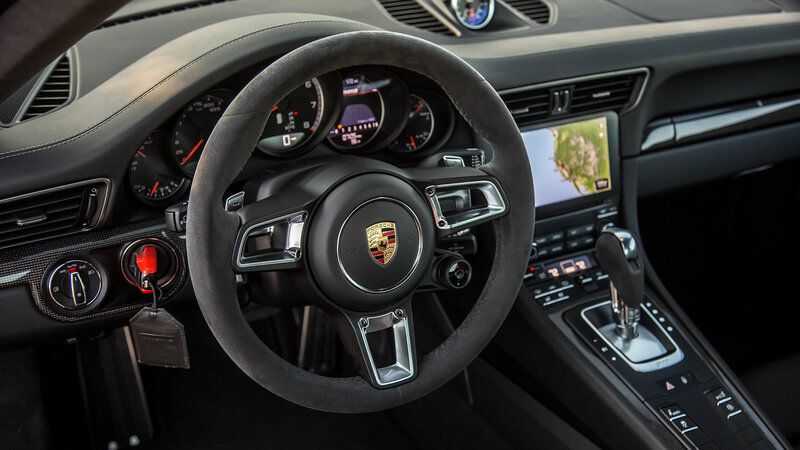 The engines of the 911 Turbo and 911 Turbo S do not only feature greater power and efficiency, they respond even more directly to the throttle inputs due to the new Dynamic Boost function and the extended Sport Chrono Package which is now standard in all 911 Turbo models. 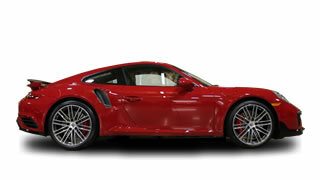 Porsche Stability Management in the new 911 Turbo models now enables greater performance at the push of a button. When the PSM button on the center console is pressed briefly, the system activates the PSM Sport mode. This function can be used independent of the Sport Plus mode. Compared to PSM On, the PSM Sport allows much larger yaw movements as well as more wheel slip. On the racetrack, drivers can approach the performance limits of their vehicles without sacrificing the safety of PSM assistance when needed. A warning light and a message in the instrument cluster indicate that PSM intervention is limited. The driver can completely deactivate the system by pressing the PSM button like before. 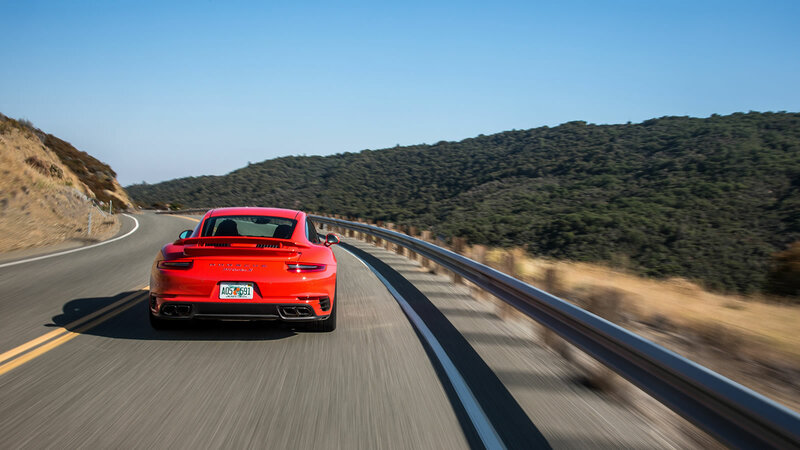 Porsche Traction Management (PTM) also contributes to the further enhanced driving dynamics of the new 911 Turbo models. For example, the plates in the coupling of the electro-hydraulically controlled all-wheel drive system with a water-cooled transfer case have a higher friction coefficient to ensure that the enormous torque of the turbo engines is transferred to the front wheels precisely and consistently. The system’s further improved control quality ensures that the distribution of forces between the front and rear wheels occurs even faster and more precisely than before. This results in better and more precise handling, traction and driving performance. The further developed PTM also offers advantages when approaching the lateral limits of the car. Handling is more well-rounded and precise, because the reaction of the system to accelerator pedal and steering wheel inputs is executed even more precisely. The dynamic and fully variable distribution of torque between the front and rear axles reduces wheelspin and necessary interventions of PTM and results in further improved control quality. 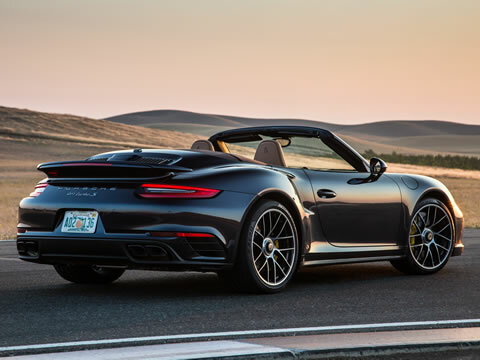 As in the previous generation, Porsche Dynamic Chassis Control is standard on the 911 Turbo S and optional on the 911 Turbo. This active anti-roll system blends the lowest possible body roll angle in aggressive driving situations with a high level of comfort in straight-line driving by substantially decoupling the anti-roll bars in the latter condition. On uneven road surfaces, PDCC resists suspension spring compression, improving handling by compensating for body roll up to the limits of adhesion. This feature also ensures ideal tire contact to the road surface, enabling more lateral grip and increasing speed through turns. This results in faster lap times. PDCC provides greater steering feedback and precision. When the SPORT Plus mode is activated, the PDCC system reacts more aggressively. As on the previous model, active rear axle steering, powered by electromechanical actuators on either side of the rear axle, varies the steering angle of the rear wheels by up to 2.8 degrees opposite the front axle’s steering angle or up to 1.5 degrees in the same direction. For reference, a steering angle of 2.8 degrees at the front wheels corresponds to a 45-degree steering wheel angle. 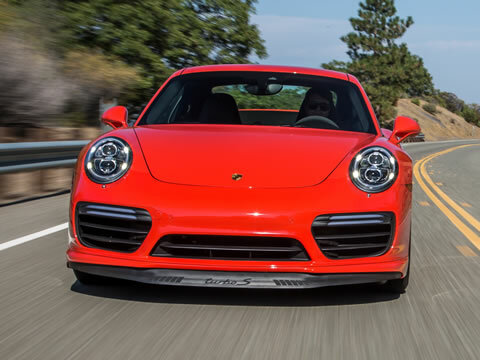 Active rear axle steering achieves two effects: when the front and rear wheels turn in opposite directions, which occurs at speeds below 31 mph, the 911 Turbo handles like a vehicle with a considerably shorter wheelbase, exhibiting sharp responses and agility in turns as well as easier parking maneuverability. 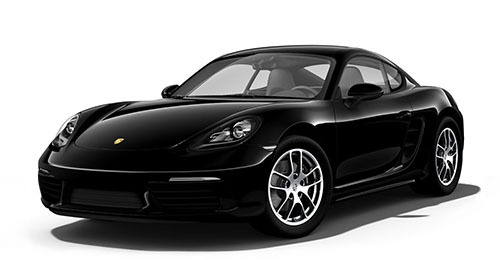 At 34.8 feet, the 911 Turbo models have a smaller turning circle than all other competitors. 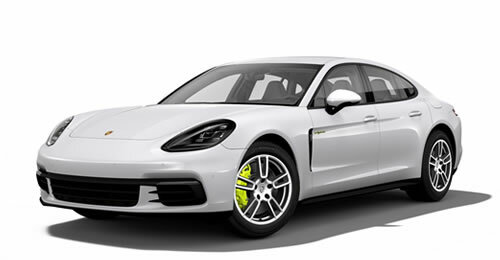 Above 50 miles per hour, the front and rear wheels turn in the same direction, lengthening the vehicle’s perceived wheelbase. This yields greater stability during lane changes, especially at high speeds. With both axles steering in the same direction, response to the steering wheel is especially rapid and yet less disruptive to the chassis. Furthermore, the high lateral force potential at the rear axle allows for a steering ratio that is ten percent more direct. The steering has largely been adopted from the previous model, however the screw connection points for the front axle cross members are now in a new position. This changes the steering kinematics of the front axle which results in a more dynamic steering response. Visually, the new 911 Turbo generation incorporates the distinctive design features of the new 2017 911 Carrera models, accompanied by the typical styling cues of the 911 Turbo. The new front fascia with side airblades and LED front lights with position lights and direction indicators give the front end a wider look along with the additional louver in the middle air intake. The LED headlights — now standard in the 911 Turbo models coupled with the Porsche Dynamic Light System (PDLS) — include four-point daytime running lights, dynamic leveling control, speed-dependent headlight range control, dynamic cornering lights and a headlight cleaning system. 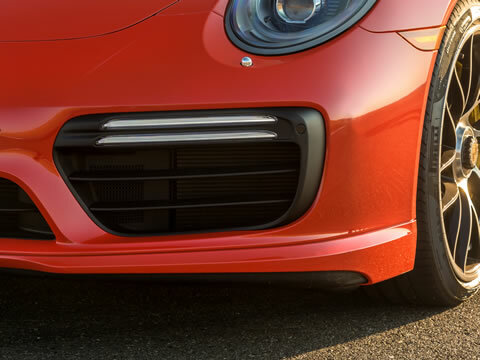 The 911 Turbo S models also offer the dynamic, camera-based PDLS Plus headlights with high beam assistant. 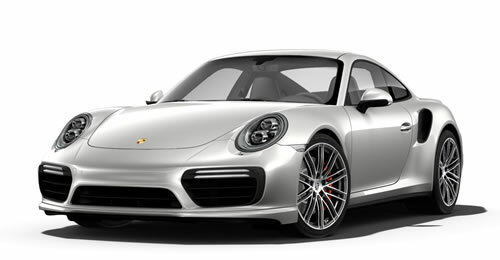 All 911 Turbo variants are equipped with new 20-inch wheels. 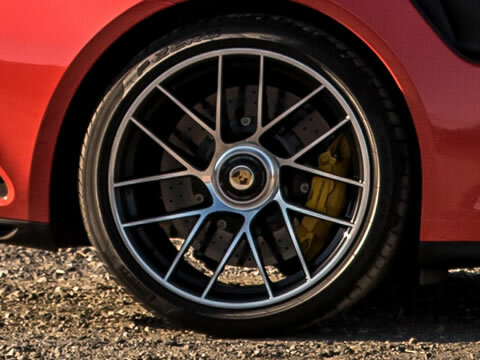 The standard center lock wheels on the 911 Turbo S now have seven instead of ten dual spokes. 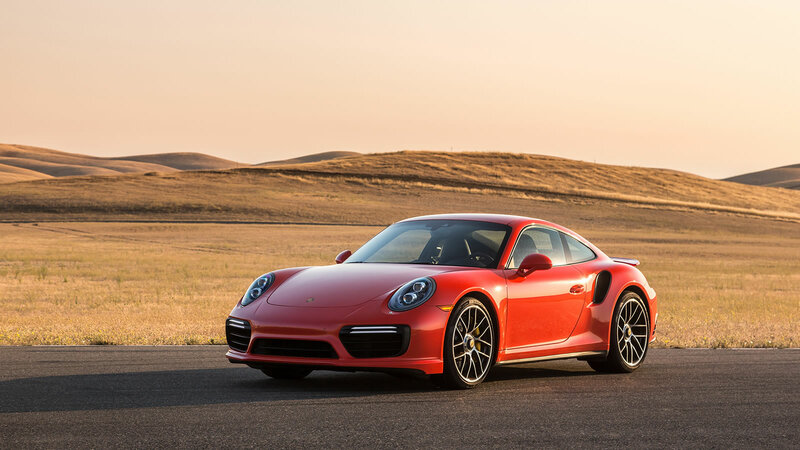 The standard wheels on the 911 Turbo are one-half inch wider than before: 9 J x 20 in front and 11.5 J x 20 at the rear – the same size as the 911 Turbo S wheels. The rear fascia also gives the car a fresher, more striking look while accentuating the width. Three-dimensional taillights with four-point brake lights and aura-like illumination immediately stand out. 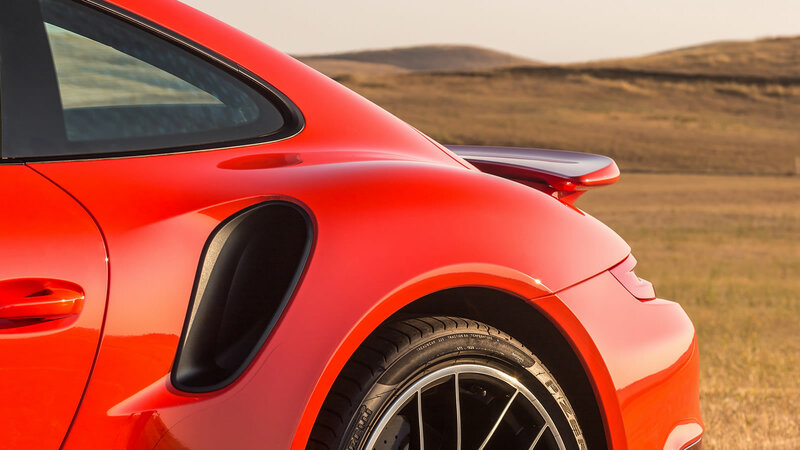 Additional air outlet ports for charge-air cooling and redesigned dual tailpipes characterize the latest generation of the 911 Turbo. 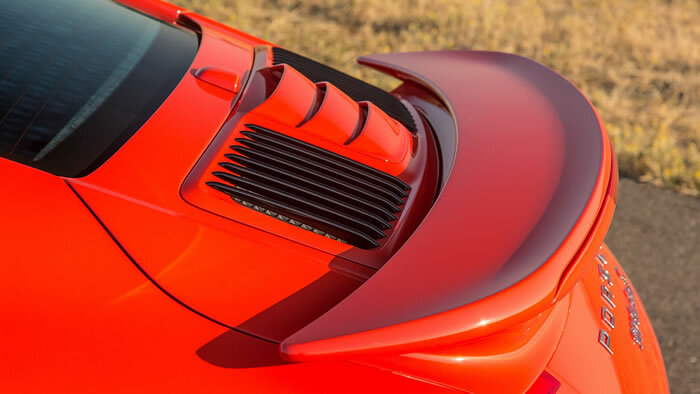 The rear decklid cover was also reworked and now features a three-part design: right and left with longitudinal vanes in black, and central air intake vanes with a separate cover for optimized air induction. 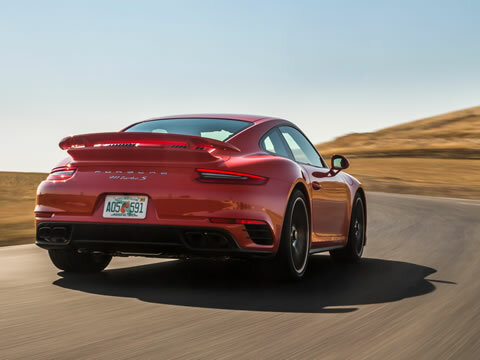 Like before, the 911 Turbo has chrome-plated stainless steel tailpipes, while the 911 Turbo S is characterized by black-chrome-plated stainless steel tailpipes. As introduced in the previous generation, the Porsche 911 Turbo features adaptive aerodynamics, helping it achieve superior usability, efficiency, and performance. Without active components, aerodynamic tuning always represents a compromise between efficiency and performance. 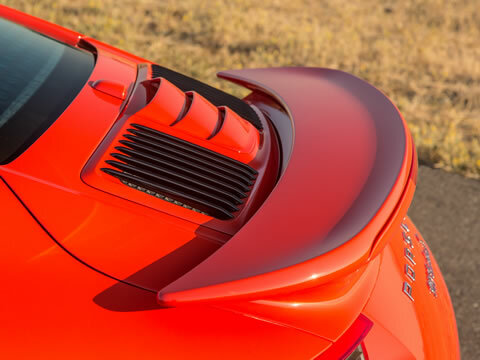 Porsche Active Aerodynamics (PAA) — based on a unique combination of a front spoiler that can be extended in multiple stages and a rear slotted wing that is adjustable in height and attack angle — allows the 911 Turbo to adapt its aerodynamics at the press of a button. 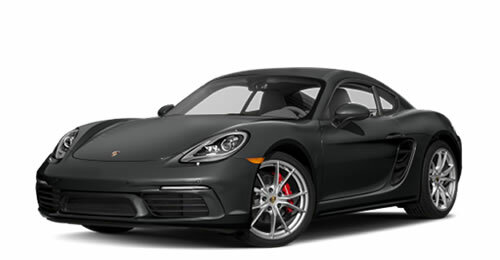 The 911 Turbo switches between different aerodynamic modes while preserving the balance of aerodynamic lift between the front and rear axles. PAA controls the front spoiler and rear wing in three basic modes. Initially, both are fully retracted. 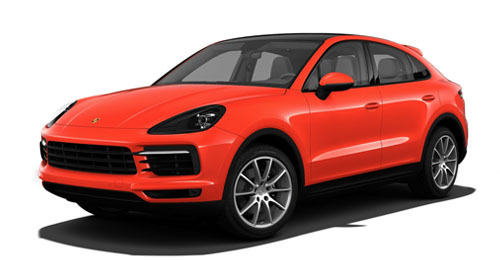 With the front spoiler retracted, a large approach angle and increased ground clearance is achieved, significantly minimizing scraping and impacts on steep ramps, driveways and curbs. PAA stays in the initial mode up to a vehicle speed of 75 mph, at which point the Speed mode is initiated. 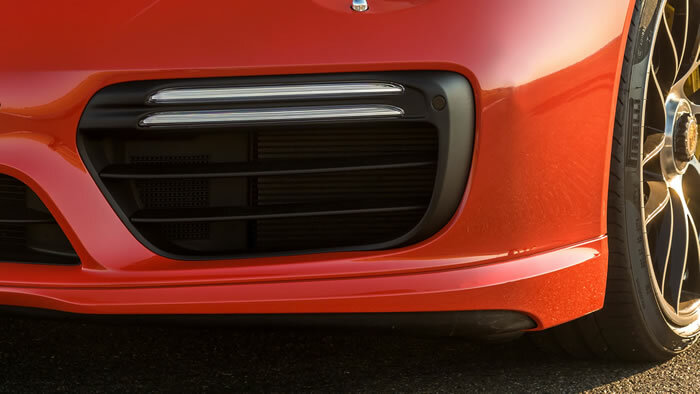 Speed mode extends the two outer segments of the three part front spoiler. 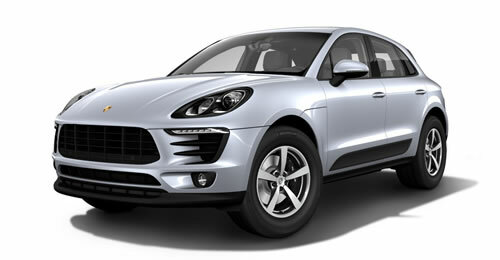 This diverts more air around the body, which reduces aerodynamic lift at the front axle. Simultaneously, the rear wing is extended one inch upward. In Speed mode, the total drag coefficient of the 911 Turbo is very low, improving fuel economy and enabling a maximum speed of 198 mph and 205 mph in the S model. When the car’s speed drops below 50 mph, PAA automatically switches back to the initial setting. 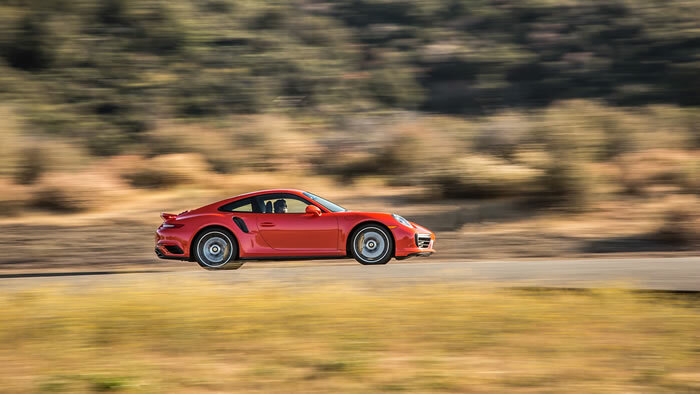 The "Performance" mode, which is activated in Sport Plus mode, adds an entirely new aerodynamic dimension to PAA in the 911 Turbo. 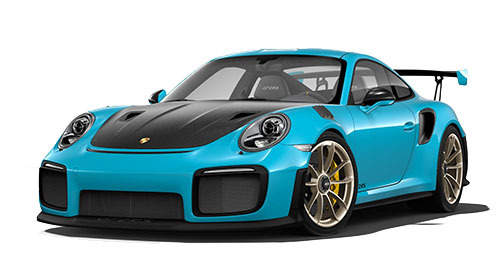 In this mode, at 186 mph, the active aerodynamics generate 291 pounds of downforce. By pressing the vehicle even more forcefully to the road, maximum lateral grip is increased by ten percent at this speed. To generate the extra downforce in Performance mode, the middle section of the front spoiler is extended, joining the two side sections. Even more air is diverted around the vehicle, generating a low pressure zone behind the spoiler. Simultaneously, the rear wing is extended to a height of three inches and angled forward seven degrees. 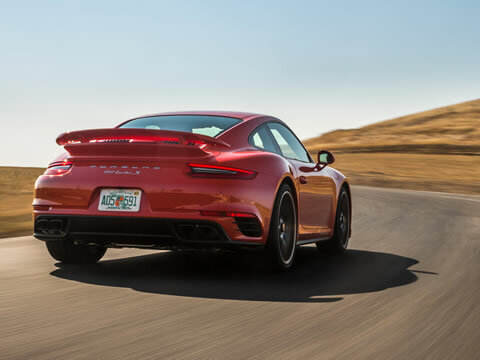 The aerodynamic capabilities of the new 911 Turbo now place its performance to levels previously reserved for Porsche GT sports cars. Switching from the "Speed" mode to the "Performance" mode shortens lap times on the North Loop of the Nürburgring by two seconds. An Aerokit is optionally available for the 911 Turbo models, providing up to 40 pounds of additional downforce at 186 mph. It encompasses a new front spoiler with side fins and a completely redesigned rear deck lid that has a fixed rear spoiler with side winglets while maintaining the automatically adjusting rear wing. 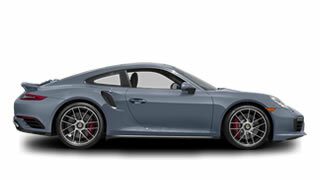 Carmine Red and Miami Blue are new available special colors for the 911 Turbo models. 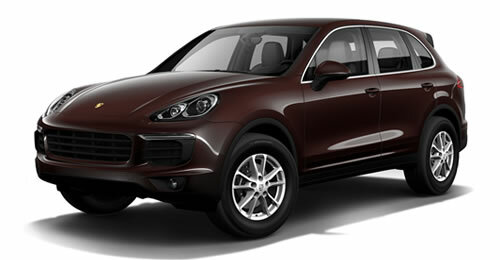 Inside, Saddle Brown is available as a new leather color; also new is the special color Bordeaux Red. The two-tone Black/Bordeaux red interior is being offered as the standard color scheme for the 911 Turbo S models for the first time. The new Porsche Communication Management system with online navigation and a state-of-the-art touchscreen is as easy to operate as a smartphone. Online capability has been improved to include real-time traffic information, Google Earth and Google Street View. The system can be readily paired with a smartphone, providing access to many more apps. 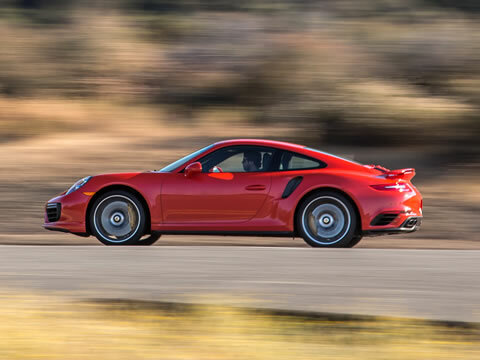 To reduce the severity of collisions, Porsche is now also implementing the automatic post-collision braking system in the 911 Turbo. After an initial collision, it automatically brakes the vehicle to slow it. This is done even if the driver is no longer pressing the brake pedal. This can prevent secondary collisions or reduce their severity. The driver can override the system at any time by pressing harder on the brake pedal or accelerating. 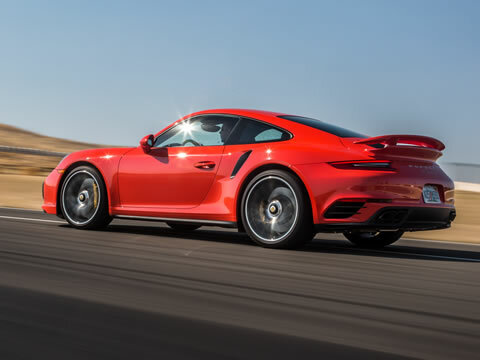 The brakes of the 911 Turbo models feature red six-piston aluminium monobloc fixed calipers at the front and four-piston aluminium monobloc fixed calipers at the rear. The brake rotors diameter is 15.0 inches front and rear.The brake calipers have an enclosed monobloc construction. This makes them tougher but lighter, enabling a more rapid response and release of the brake, even under extreme loads. The brake rotors are cross-drilled for better performance in the wet. The cast iron composite brake system offers a further increase in braking power and features lightweight brake rotor hubs made of aluminum. The rotors on the front and rear axles feature a friction ring made of gray cast iron and brake rotor hubs made of aluminum. Compared with comparable, one-piece brake rotors made of gray cast iron, the brake disc hubs made of aluminum offer a weight advantage for unsprung masses of approximately 8.8 lbs. per vehicle. In addition to reducing the vehicle weight, this also reduces the rotating and translational masses and improves driving dynamics. The brake rotors hubs and brake rotors (friction rings) are connected by means of several radially arranged pins made of stainless steel. 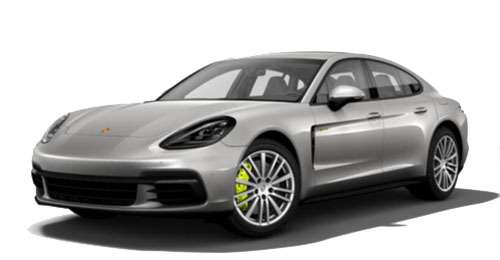 The Porsche Ceramic Composite Brake (PCCB) is standard in the 911 Turbo S and optional on the 911 Turbo. The cross-drilled ceramic brake discs have a diameter of 16.1 inches at the front and 15.4 inches at the rear for an even more formidable braking performance. 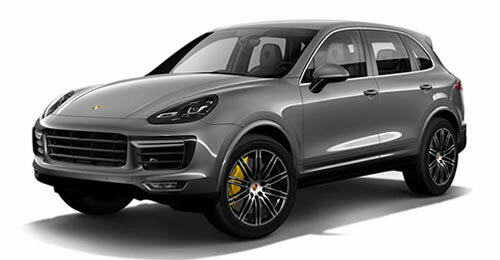 The use of six-piston aluminum monobloc brake calipers on the front axle and four-piston aluminum monobloc units at the rear (all finished in yellow) ensures extremely high brake forces which are exceptionally consistent, a crucial necessity. On the 2017 model, the ceramic brake rotors are no longer spring mounted, but held in place with bolts. The brake rotor hubs of the PCCB system are made of forged and anthracite-anodized aluminum, while the rotors themselves feature a high level of ceramic content. The key advantage of the ceramic braking system is extremely low weight of the ceramic brake discs, which are approximately 50 percent lighter than standard discs of similar design and size. This reduces the unsprung and rotating masses, resulting in better road-holding and increased comfort, particularly on uneven roads, as well as greater agility and improved handling. 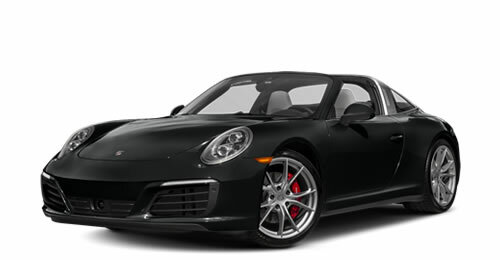 Like the 2017 911 Carrera and Targa models, the new 911 Turbo is available with Lane Change Assist. This system monitors the drivers blind spots and areas to the rear of the vehicle on both sides behind using a radar sensor. If the system detects another vehicle in the blind spot, it informs the driver using a visual signal in the corresponding door mirror panel. The system is active over a speed range from 20 to 155 miles per hour, and it can be activated or deactivated in the instrument cluster. Cargo area volume (cu.-ft.) front trunk 115 l / 4.06 cu.-ft. 115 l / 4.06 cu.-ft. 115 l / 4.06 cu.-ft. 115 l / 4.06 cu.-ft. Cargo area volume (cu.-ft.) rear seats 260 l / 9.18 cu.-ft. 160 l / 5.65 cu.-ft. 260 l / 9.18 cu.-ft. 160 l / 5.65 cu.-ft.
Fuel tank capacity - refill volume (gal) 17.9 gal. 17.9 gal. 17.9 gal. 17.9 gal. Curb weight (lbs) 3516 lbs. 3671 lbs. 3527 lbs. 3682 lbs. Gross Vehicle Weight (lbs) 4431 lbs. 4553 lbs. 4387 lbs. 4509 lbs. Payload range (lbs) - depend on options 915 lbs. 882 lbs. 860 lbs. 827 lbs. Acceleration 0-60 (sec) 2.9 sec. 3.0 sec. 2.8 sec. 2.9 sec. Quarter mile time 11.0 sec. 11.2 sec. 10.8 sec. 11.0 sec.